Men who smoke cannabis could be damaging their fertility, research carried out by Queen's University Belfast has suggested. The study by the university's Reproductive Medicine Research Group examined the direct effects on sperm function of THC, the active ingredient in cannabis. The group found that THC made sperm less likely to reach the egg to fertilise it. They also discovered that the presence of cannabis impaired another crucial function of sperm - the ability to digest the egg's protective coat with enzymes to aid its penetration. The government reclassified cannabis to a class C drug in January, putting it on a par with tranquilisers. Dr Sheena Lewis, from the university's Department of Obstetrics and Gynaecology, said on Wednesday that the recent reclassification of cannabis made research on its effects more important. "The need to determine its effects on male fertility is even greater, so that men can make an informed choice about smoking the drug based on its risks to their health," she said. The idea for the study came after researchers looking at the lifestyle habits of infertile men noticed that many men attending infertility clinics at Belfast's Royal Maternity Hospital were regular cannabis users. Dr Lewis told delegates at the British Fertility Society's annual meeting in Cheltenham that recent experiments on sea urchin sperm suggested that cannabis may be a major cause of infertility. "These experiments on human sperm tell the same story," she said. One in six couples in the UK are affected by infertility, with 40% of these cases due to problems with sperm. 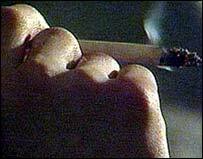 Dr Lewis said: "It is estimated that 3.2m people in Britain smoke cannabis, and that figure may now increase. "Add the two together and we may find that the use of recreational drugs will exacerbate male fertility problems."